Peggy has been working alongside Northside Hip Hop Archive and IPLAI for this co-presentation with CKUT 90.3 FM in honour of Butcher T. Performances by Nomadic Massive, Narcy and Strange Froots. This Friday, January 20, Peggy will be moderating a panel with Roadsworth, Webster, Charlie Bourdreau (Image+Nation) and Lianne Decary-Chen (Tech Witches) on arts and activism for Evenko's Entertainment Management Conference. Click here for more information. If you missed the fantastic article about Art Not Love Records, read it here! Tomorrow night, Hua Li (aka Peggy Hogan) will be taking the stage in the SAT's dome as part of the 2014 M pour Montreal festival! 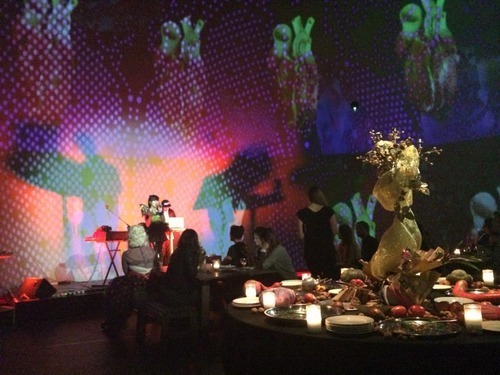 Don't miss this fantastic media art experience with performances from your girl, and Ohara. This Friday, Hua Li plays the SAT, opening for the immersive performance experience that takes us to the spectacular world of baroque times amidst our contemporary era, Party Like it's 1699. Check out Hua Li's live performance, joined onstage by her right-hand-man, Gloze, followed by her digital self in Party Like it's 1699 at 8PM. Delicious food will be served by handsome 17th Century French men and women. For tickets, click here!